Father Nicholas Gruner is a Canadian-born Catholic priest who was ordained in Italy in 1976. When he returned to Canada with the permission of his bishop, he was appointed Executive Director of the National Committee for the National Pilgrim Virgin of Canada (NPV) in 1978. Little did he know he was setting his foot on a path that would lead him into conflict with some of the highest authorities in the Vatican. Over the next decade, Fr. Gruner built the NPV organization from a mere handful of followers to the largest apostolate in the world devoted to promoting the full Message of Fatima. In the process, Fr. Gruner’s work came to the attention of certain Vatican officials who regarded the Message of Fatima as “politically incorrect.” Our Lady’s request for the consecration of Russia to Her Immaculate Heart conflicted with their “Ostpolitik,” which required muzzling criticism of Russian communism for “diplomatic” reasons. Displeased officials began planting seeds that were to grow into an escalating process of harassment. These seeds began to bear fruit in 1989, when Fr. Gruner received a surprising and disturbing letter from the new Bishop of Avellino, Gerardo Pierro. Bishop Pierro was the successor to Bishop Pasquale Venezia, who had ordained Fr. Gruner in 1976, and from whom he had written permission to work outside the Italian diocese. Now, Bishop Pierro threatened to revoke that permission. Saying he was responding to concerns expressed by the Vatican Secretary of State, Bishop Pierro wrote to both Fr. Gruner and Bishop Thomas Fulton of St. Catharines, Ontario — the diocese where Fr. Gruner resides. This prompted an offer of incardination by Bishop Fulton, but only if Fr. Gruner abandoned his Fatima apostolate, a clearly unacceptable condition. Obviously, this proposition did not originate with either Bishop Pierro or Bishop Fulton; it came from the office of the Secretary of State, and it laid bare the Vatican’s real intentions. The objective was not simply to arrange Fr. Gruner’s incardination in a Canadian diocese, which could easily be done without any other terms or conditions attached. Nor was the objective to return Fr. Gruner to Avellino to serve some useful purpose there. In the context of the offer, returning to Avellino was not presented as a useful alternative at all; rather, it was a potential punishment for failing to comply with the real objective, which was to abandon the Fatima apostolate. That, unmistakably, was the ultimate edict: be silent about Fatima, or else. Shortly afterwards, Fr. Gruner received another letter (apparently written a month earlier), from Cardinal Angelo Innocenti, Prefect of the Congregation for the Clergy at the Vatican. The letter threatened Fr. Gruner with possible suspension unless he was either incardinated in Canada or returned to Avellino immediately. Fr. Gruner responded with a letter pointing out that the Cardinal had no right to intervene in this way, since the Bishop of Avellino had issued no such orders of his own. In a further step, Fr. Gruner also appealed to the Pope against the Cardinal’s abuse of authority. Cardinal Innocenti never replied or wrote to Fr. Gruner again. A few months later, Monsignor Allan McCormack, then chancellor of the Archdiocese of Toronto, sent a notice to all priests of Toronto calling Fr. Gruner’s status as a priest “irregular,” and discouraging support of his apostolate. As the chancellor of Toronto had expected, this led to reports in some Catholic newspapers implying that Fr. Gruner was a “vagus,” or renegade priest. After being repeatedly frustrated in his attempts to meet with Msgr. McCormack’s superior, Toronto’s Archbishop (now Cardinal) Aloysius Ambrosic, Fr. Gruner took the only action left to him, and filed a civil libel suit in Toronto, which is still pending. After failing in this attempt to silence Fr. Gruner, the Vatican waited until 1992 to make its next move. The occasion was a conference of bishops at Fatima organized by Fr. 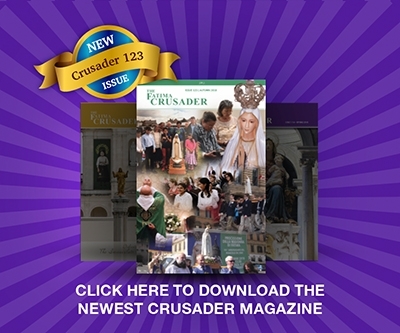 Gruner’s quarterly publication, The Fatima Crusader. Vatican officials published false and misleading declarations in L’Osservatore Romano, claiming the conference was unauthorized, even though authorization is neither required nor given for such events. Some 35 of the more than 100 bishops who had accepted invitations (and who had accepted their airfares to Fatima to be paid by The Fatima Crusader), were discouraged by these declarations, and failed to attend. While Fr. Gruner was at Fatima, an extraordinary incident occurred. He was physically attacked by two men, one of whom later admitted that he had been acting under orders from Monsignor Luciano Guerra, the Rector of the Fatima shrine. Msgr. Guerra, who remains Rector at Fatima, claimed the attack was staged by Fr. Gruner as a “publicity stunt”. Less than a year later, in the summer of 1993, Fr. Gruner obtained an offer of incardination from Bishop Gilbert Rego of the diocese of Simla and Chandigarh, India, whom he had met at the Fatima conference. Accordingly, Fr. Gruner wrote to Bishop Antonio Forte, who had succeeded Bishop Pierro in Avellino, requesting excardination from his diocese, normally a simple formality. It took more than three months for Bishop Forte to respond to this request, and when he did, his letter advised that he declined to give the excardination. As his reason for this extraordinary decision, he cited a direct order from Archbishop Crescenzio Sepe, who was then the de facto head of the Congregation for the Clergy. The Archbishop’s instructions to Bishop Forte to withhold excardination were entirely outside his jurisdiction, and had no legal validity. Nevertheless, Bishop Forte obeyed him, and refused to act. Early in 1994, Fr. Gruner went to Avellino, and met with Bishop Forte in an attempt to resolve the matter. The Bishop confirmed that Fr. Gruner remained a priest in good standing, and directed him to return to Canada, where he would be told what to do by means of a letter. When the promised letter arrived three weeks later, it delivered a profound shock. It claimed Fr. Gruner was in Canada without permission and it contained a direct order from Bishop Forte to abandon the Fatima apostolate and return immediately to Avellino, or face suspension of priestly faculties. The threat of suspension astonished Fr. Gruner, as it was flagrantly contrary to Canon Law. For such a penalty to come into play, a crime must have been committed. This had not happened, yet here was a threat to impose the penalty arbitrarily, without any justification in Canon Law. Even more astonishing, the orders to do this were orchestrated by the Congregation for the Clergy, which is supposed to safeguard the rights of priests. Instead, they were doing the opposite, literally ordering an abuse of power. Fr. Gruner responded with a detailed defense of his position, and when 30 days elapsed without a reply from Bishop Forte, he filed a formal appeal against the order, as required by Canon Law. The appeal suspended the effect of the bishop’s order, allowing Fr. Gruner to continue the work of his apostolate. Vatican interference with that work also continued. When a new Fatima conference of bishops was organized for the autumn of 1994 in Mexico, it quickly came under attack from the Vatican Secretary of State, via the network of Nuncios and other Vatican emissaries in capitals around the world. They sent letters to all Catholic bishops, and also obstructed Mexican visas for many, substantially discouraging attendance, but their interference angered some of the bishops who were not intimidated. Also in 1994, Fr. Gruner got his first taste of “justice” as administered by his Vatican opponents. Cardinal Jose Sanchez and Archbishop Crescenzio Sepe, then Prefect and Secretary, respectively, of the Congregation for the Clergy, rendered a decision against Fr. Gruner’s appeal of Bishop Forte’s order. Both these prelates had been directly involved in writing illicit letters to bishops and issuing behind-the-scenes instructions to foil Fr. Gruner’s attempts to obtain incardination with a new bishop. When Fr. Gruner objected to the obvious impropriety of these men sitting in judgment on their own actions, he was astounded to be officially advised that the right to impartial judgment “was not foreseen in the legislation” on administrative proceedings in the Church! The case then moved up to the Vatican’s supreme tribunal, the Apostolic Signatura. For his defense, Fr. Gruner was obliged to retain one of only 16 canon lawyers accredited to appear before the Signatura. The services of the lawyer he engaged in 1994, Carlo Tricerri, proved sorely deficient. Mr. Tricerri failed to examine all the documents in the case, and filed a seriously erroneous and incomplete reply to the Signatura without Fr. Gruner’s approval. Then, when the Signatura issued a judgment allowing only 10 days for appeal, Mr. Tricerri simply filed it away, without even notifying Fr. Gruner of its existence. Another 17 months passed before Fr. Gruner finally saw a copy of this document, at which point his right of appeal was denied. Inadequate legal services were only part of the problem in obtaining justice at the level of the Signatura. Here again, the leading member of the judge’s panel, Cardinal Gilberto Agustoni had been actively involved in the campaign against Fr. Gruner and his Fatima apostolate. He did not recuse himself from the case, and thus Cardinal Agustoni presided as the Signatura’s Prefect when it handed down its ruling against Fr. Gruner on May 15, 1995, which ruling Fr. Gruner only received many months later. In mid-1995, Fr. Gruner published an Open Letter to the Pope in Il Messaggero, one of Rome’s leading newspapers. Signed by two bishops and thousands of priests and lay people, it protested the abuse of power by anti-Fatima bureaucrats in the Vatican, and asked the Holy Father to intervene. The Pope took no direct action, but Cardinal Agustoni later took the unprecedented step of recusing himself from further participation in Fr. Gruner’s case. Towards the end of 1995, an official decree of incardination was received by Fr. Gruner from Archbishop Saminini Arulappa of Hyderabad, India. He required no additional document of excardination from the current Bishop of Avellino, since a letter from the previous bishop in 1989 had already given assent to Fr. Gruner’s incardination elsewhere. Under Canon Law, Fr. Gruner was now incardinated in Hyderabad, not Avellino, and he had his new bishop’s express permission to continue his Fatima apostolate as before, based in Fort Erie, Ontario. A third Fatima Crusader Peace Conference was organized in Rome in late 1996, and once again, various Vatican officials did all in their power to discourage attendance. A letter to all bishops from the Congregation for the Clergy described Fr. Gruner’s activities as “harmful” (without saying how), and called his defense of his Fatima apostolate “a regrettable situation” (without saying why). Shortly before the conference, another letter to all Catholic bishops was issued by the Congregation for Bishops, urging them not to attend an “absolutely unauthorized” event, which did not require “authorization” in the first place. It was signed by Cardinal Bernard Gantin who was on the panel of Signatura judges considering Fr. Gruner’s case. Nevertheless, more than 200 bishops, priests and lay people attended. During the conference, Fr. Gruner’s canonical complaint against two Vatican officials was placed directly in the Pope’s hands at a public event. In 1997, Fr. Gruner discovered yet another way his Vatican opponents were acting illicitly against him. As he struggled to find a new lawyer to represent him before the Signatura, he discovered the reason for the reluctance of those he approached: They were being privately advised not to take the case by Archbishop Zenon Grochelewski, who had been appointed to replace the now-recused Cardinal Agustoni on the tribunal! One of the reluctant lawyers, Francesco Ligi, reported a telling admission made by Archbishop Grochelewski. Mr. Ligi, a respected advocate in the Supreme Court of Italy as well as in the Signatura, said the Archbishop advised him to withdraw because “this case isn’t about Fr. Gruner’s incardination, it’s about what Fr. Gruner says.” This remark amounted to admitting that the incardination issue was simply being used to give the appearance of legitimacy to an action designed to achieve another — and quite illegitimate — purpose: silencing Fr. Gruner. When Fr. Gruner was finally able to engage another Signatura-approved lawyer, Sandro Gherro, his services proved to be just as ineffective as the previous one. When Mr. Gherro received a document from the Signatura setting out an alleged (and substantially erroneous) summary of facts and giving 10 days to respond, he simply filed it away, and allowed the allotted time to elapse. The Signatura then officially adopted their own version of events as “facts,” and issued a second ruling against Fr. Gruner on January 20, 1998. In the spring of 1998, Fr. Gruner published a second Open Letter to the Pope in the Rome daily Il Messaggero. Again pleading for relief from bureaucratic harassment of his apostolate, it was signed by 27 archbishops and bishops, 1,900 priests and religious and more than 15,000 lay people. Once again, the secretive and illicit maneuvers of Fr. Gruner’s opponents were exposed to the light of day. In the autumn of 1998, the Signatura delivered a new blow in the form of a document produced by a Vatican official known as the “Promoter of Justice”. It was supposed to be a summary of the facts of the case and the canonical positions of the parties, to assist the tribunal in its deliberations. In fact, it was a blatantly prejudicial catalogue of unfounded denunciations of Fr. Gruner, many of them quoted from letters he had never seen. Before allowing him to see this latest document, the Vatican tried to get Fr. Gruner to take an oath to keep it secret, which he refused to do. The result was that Fr. Gruner was not even allowed to have a copy of the document. His lawyer was forced to travel 6,000 miles to Canada to display the document, under orders not to let Fr. Gruner keep a copy! Fr. Gruner replied to the Promoter’s document with a detailed refutation of its factual errors and unsupported claims. He also formally requested copies of 20 letters cited by the Promoter, in accordance with his fundamental right as the defendant in the case. Copies of the letters were never provided, and the Signatura never mentioned the Promoter’s document again. In mid-1999, Fr, Gruner sent the Bishop of Avellino a new document affirming that he is now incardinated in the diocese of Hyderabad. The Apostolic Signatura had the same information, but simply ignored it when ruling against Fr. Gruner in September 1999. In filing his rebuttal to this decision, Fr. Gruner found that the third canon lawyer he had hired to defend him was now being pressured to drop his case. Another Fatima Peace Conference, this time in Hamilton, Ontario in October 1999, was subjected to the same harassment from Vatican officials as previous conferences. Over 300 people attended, but most of them were lay people. In November of 1999, Fr. Gruner sent a new canonical complaint to the Pope, naming Cardinals Agustoni, Innocenti and Sanchez, as well as Archbishops Sepe and Grochelewski, and Bishop Forte. Like the previous complaint, this one was deemed to be officially accepted the following May, when the Pope made no response to it within the time allotted by Canon Law. With matters seemingly stalled in the Apostolic Signatura, Fr. Gruner was suddenly attacked from a new direction. A letter was hand-delivered in early June 2000, from Cardinal Castrillon Hoyos, Prefect of the Congregation for the Clergy. With stunning disregard for Canon Law, the letter repeated false accusations already refuted in documents filed with the Signatura, and threatened Fr. Gruner with excommunication! Fr. Gruner replied, once again denying the accusations, and challenging the morality of the threat of excommunication. A month later, Cardinal Hoyos instructed various Nuncios around the world to circulate lies, including a charge of forgery, against Fr. Gruner. When challenged about this, the Cardinal amended his false accusations to lesser charges, equally false, but made no retraction or apology. Nor did he withdraw his illicit threat of excommunication. In December of 2000, Fr. Gruner filed a new canonical complaint to the Pope about Cardinal Hoyos, requesting his removal from office. Things lay dormant at the Signatura through most of 2001, while the Pope took no action in response to Fr. Gruner’s formal complaints, despite the requirements of Canon Law by which John Paul II had bound himself to hear such matters. Finally, on the day after the terrorist attacks of September 11, a new statement was issued by the Vatican press office. Citing “a mandate from a higher authority,” it said Fr. Gruner was suspended, and no one should attend his upcoming conference in Rome in early October. No reason was given for the alleged suspension. Fr. Gruner thus became the only priest in living memory to have his suspension announced to the world by a nameless higher authority for an unspecified offense. Fr. Gruner promptly denied the validity of the suspension, since it has no basis in Canon Law. A few weeks later, the Catholic University of the Sacred Heart in Rome backed out of its contract to provide facilities for Fr. Gruner’s October conference, claiming a sudden need to conduct a “structural inspection” of the building. The University’s agent later admitted she had received “an ecclesiastical telephone call” from the Vatican. Significantly, the Vatican’s efforts to silence Fr. Gruner have never taken the form of challenging what he says, the truth of which they cannot seriously contest. Instead, they have sought to discredit him personally, first by circulating unfounded accusations about his status as a priest, and later by an escalating campaign aimed unmistakably at forcing him to abandon his Fatima apostolate. In the course of this campaign, officials of the Vatican Secretariat of State, the Congregation for the Clergy and the Apostolic Signatura have repeatedly participated in breaches of the Church’s own rules protecting the right of priests to due process under Canon Law.